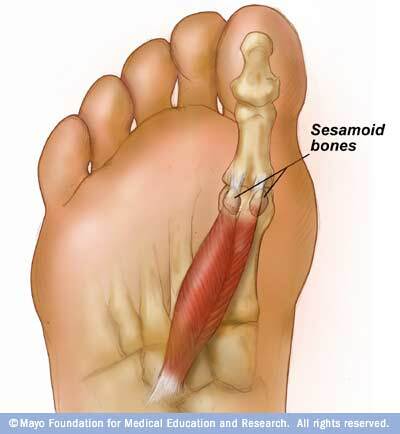 Before talking about sesamoiditis, it is useful to know what a sesamoid bone is. Most of the bones found in the body are connected to each other with ligaments to form joints. Some bones exist only within tendons and have no direct attachment to the bone that it moves against. These types of bones are known as sesamoids. Examples of other sesamoid bones in the body include the kneecap and the shoulder blade. Sesamoid bones function to allow a muscle to form an angle with the associated joint for an improved pulley action, which in turn allows the tendons greater strength and a more useful direction of pull. The sesamoids that can cause foot pain are found in sole of the ball of the foot behind the big toe. They exist in a tightly bound together pair – one called the medial sesamoid and the other the lateral sesamoid. When a sesamoid bone becomes inflamed, the condition is known as sesamoiditis. The position of the bones in the ball of the foot is shown in the diagram opposite. When the big toe and foot are totally flat to the ground, the sesamoids are in their ‘start position’ at the ankle end of their range. Here, there is a little depression for them to sit in. When the toe is fully bent – like the back foot when you are taking a long step with the other foot – the sesamoids are dragged forward to their ‘end position’, where again there is a place for them to sit. Many people with sesamoiditis develop the condition because their big toe doesn’t bend efficiently. This drags the sesamoid bones only half way forward. In this position, they rub against a bony ridge called the crista on the 1st metatarsal. One or both of the sesamoid bones then can become bruised from this repeated trauma. How do you treat Sesamoiditis ? Sesamoid injuries are generally well treated with orthotics in your shoes to correct the big toe function. Treating sooner rather than later is a good idea as the condition can be hard to shift once it becomes established. Treatment of sesamoiditis tends to take a little longer than other conditions. This is probably because the healing of these bones is slow due to their position inside the Sesamoid Apparatus. This is a gristle- like complex that surrounds the tissues and limits blood flow to the area. Often the point of pain is difficult to locate when you are pressing the area. The sesamoid usually has to be pushed sideways toward the opposite sesamoid to recreate the pain. This condition is most common in ballet dancers, runners and people who squat on their haunches. It is also common in people who have bony feet, arthritis, osteoporosis, high arched feet, very flat feet and forefoot runners. As discussed above, problems with the big toe joint, including bunions, hallux limitus and arthritis can particularly predispose a person to this condition. Treatment for sesamoiditis typically involves resting the area and avoiding activities that aggravate the pain. Strapping and ice and may be useful when first diagnosed to help relieve pain. A particular style of taping to keep the big toe from flexing can usually calm the condition down very quickly. Anti-inflammatory drugs typically don’t help as much as you might expect due to the limitation in blood flow to carry the drug them to the affected area. Often, a full length orthotic is used to help offload the sesamoids and deflect pressure away from the area. If the condition has been caused by a mechanical misbehaviour of the foot, orthotics are very important for treating the underlying condition. This includes low arches, high arches, too stiff, too ‘floppy’ or poorly aligned feet. Mobilisation of the sesamoid bones can be useful. We can use pressure from a thumb to rock the bones forward and back in their track, stretching the fibrous tissue of the sesamoid apparatus. This approach takes time and is not easy to do to yourself. We might suggest bringing in a partner for a lesson in how to do this properly. Failing conservative treatments, injections of steroids may be required. Sesamoid bones can be removed surgically, though this is only done in the worst of cases.